Arthroplasty is surgery performed to relieve pain and restore range of motion by realigning or reconstructing a dysfunctional joint. The goal of arthroplasty is to restore the function of a stiffened synovial joint and relieve pain. As a surgical procedure, it is usually performed when medical treatment has not improved function in the affected joint. 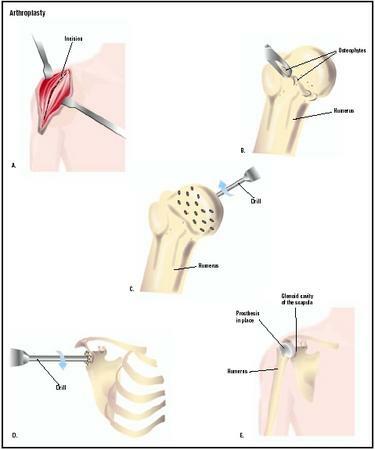 There are two types of arthroplastic surgery: joint resection and interpositional reconstruction. Joint resection involves removing a portion of the bone from a stiffened joint, increasing the space between the bone and the socket to improve the range of motion. Scar tissue eventually fills the gap, narrowing joint space again. Pain is relieved and motion is restored, but the joint is less stable. Interpositional reconstruction is surgery to reshape the joint and add a prosthetic disk between the two bones forming the joint. The prosthesis can be made of plastic, metal, ceramic material, or formed from such body tissue as skin, muscle, or fascia. When interpositional reconstruction fails, total joint replacement may be necessary. Joint replacement is also called total joint arthroplasty. In recent years, joint replacement has become the operation of choice for most chronic knee and hip problems, particularly because of advances in the type and quality of prostheses (articifical joints). Elbow, shoulder, ankle, and finger joints are more likely to be treated with joint resection or interpositional reconstruction. Arthroplasty is performed on people suffering from severe pain and disabling joint stiffness. Osteoarthritis (OA), a degenerative joint disease, is the most common condition causing joint destruction with pain and impaired movement. Other causes include rheumatoid arthritis (RA), hemophilia, synovitis, and rare bone diseases, which are all known to destroy cartilage. Joint resection, rather than joint replacement, is more likely to be performed on people with rheumatoid arthritis, especially when the elbow joint is involved. Joint replacement is usually reserved for older patients, because of the limited longevity of benefits. The younger the patient, the greater the reliance on medical treatment. these, an average of about 362,000 are knee surgeries and 295,000 are hip surgeries. The remainder are ankle, shoulder, wrist, and hand surgeries. Joint replacement surgeries are increasing; for example, 259,000 total knee replacements were performed in 1997 and 299,000 were performed in 2000. Because the primary underlying condition in patients undergoing arthroplasty is osteoarthritis, a common cause for disability among older adults, the majority of patients undergoing this surgery fit the demographic profile for osteoarthritis. Osteoarthritis is the most common type of arthritis, with over twenty million people in all parts of the United States. Both men and women have the disease; under age 45 men are more often affected, though more women than men are affected after age 45. Younger people can have the disease after a joint injury. Arthroplasty is reserved for the most severely afflicted—approximately 3% of all patients with osteoarthritis, women more often than men. Two and one-half million people in the United States have rheumatoid arthritis, which can strike people of all ages. Very few have arthroplasty because this chronic crippling disease affects not only multiple joints but other parts of the body as well, including the immune system. Patients weakened by this disease are more subject to infection and less likely to enjoy positive surgical results. Arthroplasty is performed under general (affecting the entire body) or regional (numbing a specific area of the body, such as spinal block) anesthesia in a hospital, by an orthopedic surgeon. Although many hospitals and medical centers perform common types of joint surgery, orthopedic hospitals that specialize in joint surgery tend to have higher success rates than less specialized centers. In joint resection, the surgeon makes an incision at the joint, then carefully removes the minimum amount of bone necessary to allow free motion. The more bone that remains, the more stable the joint. Ligament attachments are preserved as much as possible. In interpositional reconstruction, both bones of the joint are reshaped, and a disk of material is placed between the bones to prevent their rubbing together. Length of hospital stay depends on the joint affected; in the absence of complications, a typical stay is only a few days. Prior to arthroplasty, standard preoperative blood and urine tests are performed to rule out such conditions as anemia and infection. If a patient has a history of bleeding, the surgeon may ask that clotting tests be performed. The patient will meet with the anesthesiologist to discuss any special conditions that may affect the administration of anesthesia. Surgery will not be performed if infection is present anywhere in the body or if the patient has certain heart or lung diseases. Smokers will be asked to stop smoking. Weight loss may also be recommended for overweight patients. If surgery involves deep tissue and muscle, such as total hip arthroplasty, the surgeon may order units of blood to be prepared in case transfusion is needed to replace blood lost during the surgery. Healthy patients may be asked to donate their own blood, which will be returned to them at the time of surgery (autologous transfusion). Certain pain medications may have to be discontinued in the weeks just prior to surgery. Immediately after surgery, while still in the hospital, patients will be given pain medications for the recovery period and antibiotics to prevent infection. When patients are discharged after joint surgery, they must be careful not to overstress or destabilize the joint, requiring rest at home for a period of weeks. Physical therapy will begin immediately to improve strength and range of motion; it is the most important aid to recovery and may continue for several months. Activity may be resumed gradually, using devices if necessary, such as walkers or crutches, as recommended by the physical therapist. Lifestyle changes may include the use of special seating or sleeping surfaces, and employing home care assistance for help with shopping, cooking, and household tasks. Joint resection and interpositional reconstruction do not always produce successful results, especially in patients with rheumatoid arthritis, a chronic inflammatory disease that may continue to narrow the joint space and accelerate the formation of scar tissue. Repeat surgery or total joint replacement may be necessary. As with any major surgery, there is always a risk of an allergic reaction to anesthesia, post-operative infection, or the formation of blood clots (thrombophlebitis) that may cause pain and swelling near the surgery site and travel through the veins to other parts of the body. A joint that has undergone surgery is less stable than a healthy joint and dislocation or loosening of the resected joint may occur, especially with inappropriate physical activity. Most patients enjoy an improved range of motion in the joint and relief from pain. Younger people may actually return to some form of low-impact sports activity. However, people who have degenerative or inflammatory diseases must understand that they will not suddenly have a normal joint, even while they will gain pain relief and improved function. The number of deaths for all arthroplasty surgeries is less than 1%, with death more likely to occur among elderly patients and those with other serious medical conditions. Pain management alone, particularly with the availability of more effective pain drugs that have fewer side effects, is the primary non-surgical option when the underlying diagnosis is a form of arthritis. Non-steroidal anti-inflammatory medications (NSAIDs) are commonly prescribed for arthritis sufferers, and people with RA are given certain drugs that suppress immune system activity, shown to be a factor in this type of arthritis. A range of nutritional supplements and vitamins are reported to offer health benefits to people with OA; among them, glucosamine and chondroitin sulfate have been shown to offer some relief for pain and stiffness. Weight loss is often recommended as well. Because immobility of the affected joint can increase pain and stiffness, patients with joint disease are usually encouraged to continue some type of physical activity. Keeping the muscles strong through modest, non-weight-bearing exercise , such as stretching or swimming, is often recommended to help support the joint and maintain mobility. Various devices, such as braces or orthopedic shoes, may be recommended, as well as walking aids. Safety rails, special elevated toilet-seat extensions, bath and shower seats can make the patient more comfortable in daily life. Movement therapy, such as yoga, tai chi, and dance, may help maintain joint flexibility and slow chronic arthritis symptoms. Occupational therapy, massage therapy, and physiotherapy may help improve range of motion and overall comfort, as well as patient confidence. "Joint Replacement." In Everything You Need to Know About Medical Treatments. Springhouse, PA: Springhouse Corp., 1996. American Academy of Orthopaedic Surgeons(AAOS). 6300 North River Rd. Rosemont, Illinois 60018. (847) 823-7186. (800) 346-AAOS. Fax: (847) 823-8125. http://www.aaos.org . An orthopedic surgeon performs arthroplasty, including joint resection, interpositional reconstruction, and total joint arthroplasty (joint replacement). Orthopedic surgeons are board certified in their specialty and members of the American Academy of Orthopedic Surgeons (AAOS). Orthopedic hospitals specialize in treating orthopedic conditions and performing orthopedic surgery . Although some orthopedic surgery may be performed in other hospitals and medical centers, better surgical results have been reported in the specialized centers. Is surgery my only option? What alternatives might work? How many surgeries like mine have you performed? What can I do after surgery to improve the result and avoid more surgery? Will joint replacement be inevitable in time even if I have resection or reconstruction? What changes can I make in my lifestyle to slow the progress of arthritis? What companies or medical joint manufactures supply the artificial joints? I got arthroplasty in my second and third toe its take about six or seven weeks to be ok. Advice please, I had anthroplasty on my ankle in a Greek hospital two weeks ago, I am still in considerable pain but not as much as in the first few days post op. If anyone else has had this could you please tell me if I can expect pain until after the pins (16) have come out and will the pain continue after that. Thank you for any advice. Arthroplasty 2018 invites to be the Collaborator/Workshop/Exhibitor!! Arthroplasty 2018 is an International Conference organized by Pulsus, welcomes all the eminent researchers and scholars around the globe to be the member of “11th International Conference on Arthroplasty” scheduled on September 24-25, 2018 at London, UK. The Objective of the Conference is to reach the Advancement in the Field of Arthroplasty by the global gathering and meeting of peoples from various diversities to share the knowledge by paper presentations, poster presentation and by the delivery of speech & lectures or as a Delegate in the research forum. Arthroplasty 2018 is eagerly waiting in addressing all the participants, scholars, researchers and industrial expects to make the gathering more successful. Special Note: A group with 4-5 members can avail their special discounts in their group registration along with a complementary registration to experience the conference.